“Well, the blog is finally gone,” says Parrish. “Gone; done,” says I. We sip our Scotch in memory of blog posts of yore. And yet. Wrestling with words and abstract concepts all day, a body’s got to have hobbies. One of my current ones appears to be PLANTS! And today’s plant cried out, not literally, for TGW treatment. 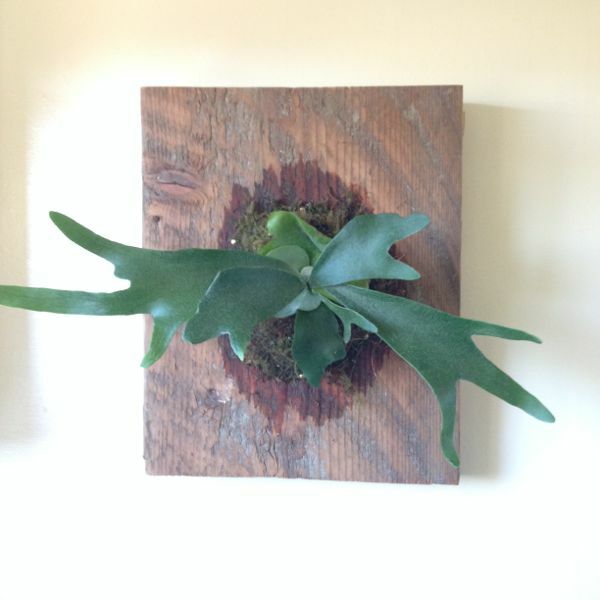 So hereinafter: how to plant a staghorn fern on your bathroom wall. The important thing about staghorn ferns is that they’re epiphytes, meaning they don’t need to root in soil. I bought one last weekend at the hipster plant store on Solano, after not seeing them many other places for sale. It came rooted in soil in a little pot. But I wanted it mounted on the wall. That is the even more important thing about staghorn ferns–they look like animals, kind of. Like a stag’s horns, I guess, but more ancient and vegetal. So of course hipsters* mount them on walls. First thing, I needed a good piece of wood. 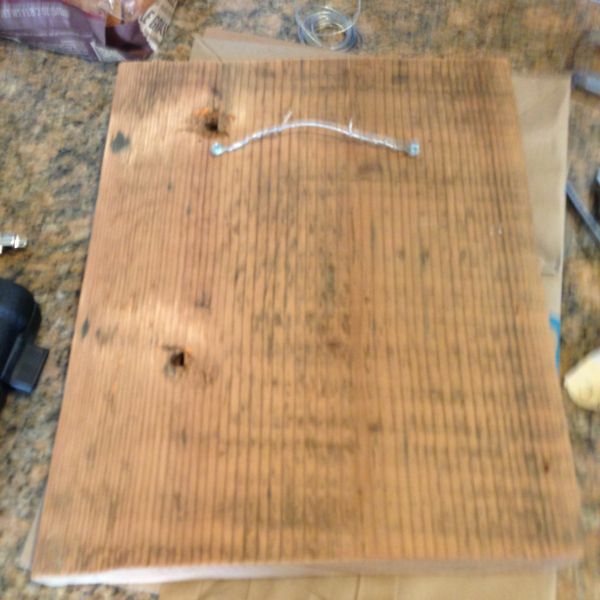 Found one at my favorite artisanal wood store for only $2, the humblest piece of wood in the place. 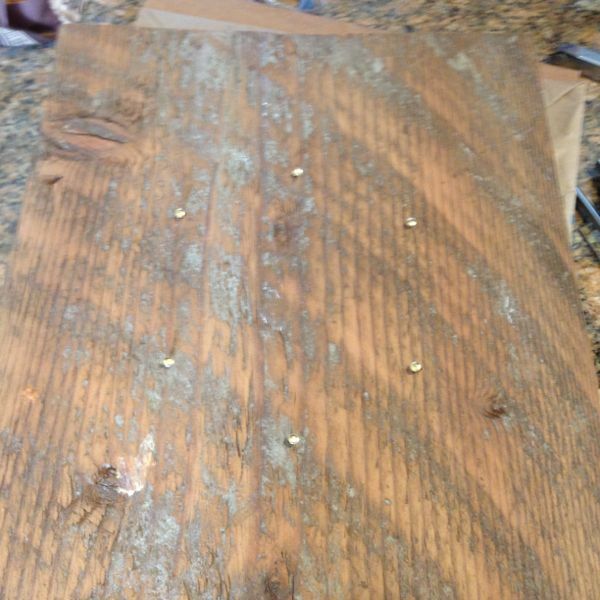 I think it’s pine, salvaged from a barrel or something, and it was $2 because it was a scrap left over from something else. About 12 inches square, I’d say, and an inch and a half thick. I sanded it roughly to clean up some kind of paint or mineral residue. Ended up looking interesting. I put some floor-protector stickies on the hex ends to keep them from messing up the wall when I hang it up. Then you get your sphagnum moss. Sphagnum moss is sold in quantities no smaller than quarter bushel; mine came in a big dried cube shape that reminded me very much of local news stories about the cops seizing bales of pot and setting it all on fire. When I asked if they had smaller bags of it, the plant-store lady suggested I use the rest to make terrariums for Christmas gifts. “Or birthdays. Or other holidays,” she said. This is why people start selling crap on Etsy; it is because they tried to buy the minimum quantity of sphagnum moss. No pictures of the moss-laying process because it was wet. You take your sphagnum moss. (Seriously, I own a lot of sphagnum moss now. I will send you some if you want.) You slice a bit off the giant cube, soak it in water, then wring it out so it’s damp. Then you have to get the soil off the roots of your stagshead fern. This was the most annoying part, and it felt so wasteful as I ran water over the roots to wash off the soil that I actually put a bowl in the sink and caught the water and then poured it on our other plants out on the deck. That is how California I am these days. With the roots mostly free from soil, you kind of layer the moss and the roots into something that strikes you as plausible. Then, run fishing line or threat over the moss/root clump to each nail, back and forth in a web, until you think it’s good. Like I said, pretty cool looking, slightly terrifying. The best part is now my bathroom smells a little like some exotic forest, or at least like a sphagnum moss farm. *A category that is almost meaningless, as I’ve probably yakked about before. However, I think “hipster Martha Stewart” does have some content to it. 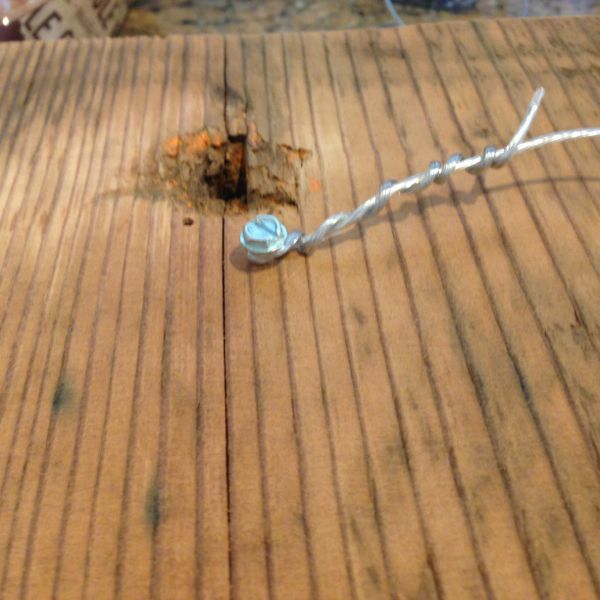 If you are a crouton petter like me, one of the nice parts of this story is the little chunk of wood being so happy to be chosen over all the more glamorous redwood and stuff. Crouton petter is a term I just learned. This plant does kind of complicated my neat categorization of plants into “looks like it is going to get loose and eat the cat” and “does not look like etc.” It looks like it might get loose and have a tense standoff with the cat and then slink back to the wall. You said, “Sphagnum.” Heh heh. And thanks for sharing! The blog’s not dead yet. Wait, what’s going on here? Who authorized this?